AP Coilovers by KW are a fully featured TUV certified coilover suspension kit at an outstanding price. Many entry level coilovers only really offer the lowered looks of a proper coilover set-up without really offering the improvements in handling that the car enthusiast desires or indeed build quality you can trust. On the other hand, these coilovers from AP are the genuine article with TUV certification, damping technology from KW, and rugged galvanised steel bodies and springs for outstanding weather protection. The other big brand feature you are getting with these coilovers is a proper factory set-up from AP engineers optimised specifically for the vehicle they are intended for. These coilovers have been configured for the best mix of ride quality and road holding offering the kind of sporty handling through corners but retaining decent travel to ensure good handling on less than perfect road surfaces. The AP coilover kits offer precise ride height adjustment allowing you to achieve the ride height and stance you want. Kits supplied with bump stops. 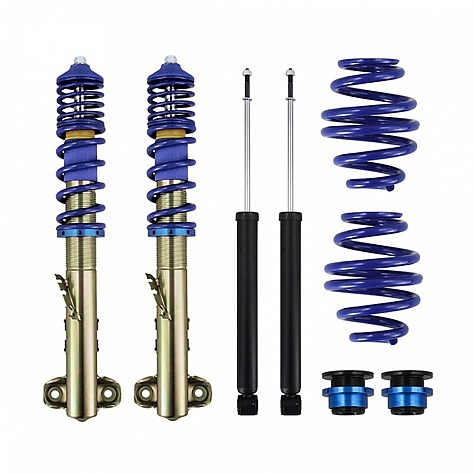 On some vehicles it isn’t possible to make the rear coilover adjustable. This should be noted on the product page where the drop will be described as “fixed”. On some vehicles it is not possible to fit a coilover to both axles because of the factory suspension arrangement (e.g. Torsion Bar rear suspension). Where this is the case adjustable dampers will normally be supplied for the axle that cannot be fitted with coilovers.